Mangalore is situated on the banks of which of the following river? Mangalore, officially known as Mangaluru, is the chief port city of the Indian state of Karnataka. The two major Rivers are the Gurupura River and the Nethravati River. The city of Mangalore lies on the backwaters of Nethravati River. Srinagar is situated along the banks of the river? Srinagar is the largest city and the summer capital of the Indian state of Jammu and Kashmir. It lies in the Kashmir Valley on the banks of the Jhelum River, a tributary of the Indus. Surat is situated on the banks of river? Surat is a city in the Indian state of Gujarat. It used to be a large seaport and is now a center for diamond cutting and polishing. Surat is located on the Tapti River, close to Arabian Sea. 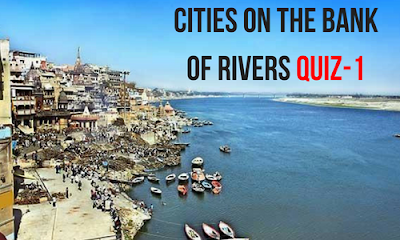 City of New Delhi is located on the banks of river? Delhi officially the National Capital Territory of Delhi (NCT), is a city and a union territory of India. It serves as the capital of India and also seat of all three branches of Government of India. Yamuna River flows through the city. Gaya is the 2nd largest city of Bihar. It is situated on the banks of the Phalgu (Falgu). Dibrugarh is situated along the banks of river? Dibrugarh is a city in the state of Assam in India. It is well known as the Tea City of India. It is the last big town on the Banks of Brahmaputra River. City of Vijayawada is located on the banks of river? Vijayawada is a city in the Andhra Pradesh Capital Region on the banks of River Krishna in Krishna district of the Indian state of Andhra Pradesh. Hospet is a city in Bellary District in central Karnataka, India. It is located on the Tungabhadra River, 12 km from Hampi, a World Heritage Site. Nellore is a city in the Indian state of Andhra Pradesh. It is located on the banks of Penna River and is the fourth most populous city in the state.